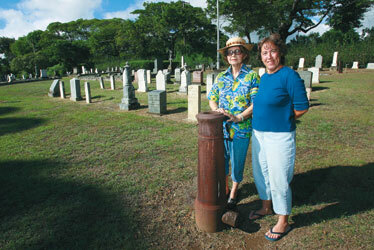 Edna Ellis, left, and Nanette Napoleon have been researching Civil War veterans buried at the Oahu Cemetery in Nuuanu. 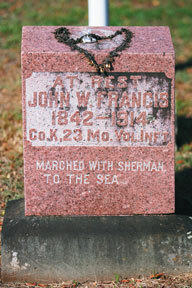 At left is a detail shot of John W. Francis' marker, which is located in the Grand Army of the Republic plot in the cemetery. Edna Ellis is your basic little old Hawaiian lady, as warm and as sweet as the day is long, and Somebody Up There is trying to tell her something. It has to do with Hawaii's involvement in the American Civil War, which ran from 1861 to 1865, during the reigns of King Kamehameha IV and President Lincoln. Old as Ellis is, that's way, way before her time. But last Memorial Day, at a Waikiki Elks Club meeting, a call went out for additional business, and suddenly Ellis was on her feet, passionately talking about the Civil War, and she didn't know what possessed her to do so. A few minutes after she finished, the club held hands to sing "Hawaii Aloha" - and a burst of wind invaded the room, flinging cups and hurling napkins into a brief maelstrom. "I figured," said Ellis, still chicken-skinned, "it was time for get busy. Go for it, sis!" The trigger came five years ago as Ellis was researching family history and came upon a newspaper article noting the death of her great-uncle, James W. Bush, a "pensioner of the War of the Rebellion." Ellis wound up in the U.S. Army Museum of Hawaii, where archivist Judy Bowman - a woman of apparently phenomenal memory - recalled Bush's name on a penciled note from a decade before. An uncle of the then-museum director had made a scratchpad list of some Civil War veterans whose homes lay in the "Sandwich Islands," or the Kingdom of Hawaii. This was enough to get Ellis started. She learned that Hawaii was torn when the war broke out, that the king declared neutrality even though regiments were formed and drilling on the Punahou School campus and elsewhere, that the sons of missionaries were leaving their New England colleges and declaring for the abolitionist cause. Hawaiian recruits, she found, were as pitiful and forgotten as Pvt. Henry Hoolulu Pitman, captured by rebels to die in Richmond, Va.'s, notorious Libby Prison, or as well-known as Samuel Chapman Armstrong, a breveted general of "colored" infantry, who later founded Hampton Institute and is buried beneath stones of Massachusetts granite and Hawaiian pahoehoe. She also met Hawaii Civil War Roundtable founder Damian Paul, who pointed out that Hawaii's involvement with sugar began with the conflict, and that Confederate raiders chased Yankee whalers right up the Wailua River on Kauai; and graveyard historian Nanette Napoleon, who showed Ellis the Grand Army of the Republic plot at Oahu Cemetery (and who provided much background for this article). "The boys from Hawaii wanted to fight to set people free," said Ellis. "But there's nothing to show for it. It's time a plaque or a monument was made, like they did at the Natatorium" for those sacrificed in the Great War. Ironically, Hawaii's contribution may already be memorialized - in the African-American Civil War Memorial in Washington, D.C. Native Hawaiians were routinely assigned to colored regiments, their "complexions" recorded upon enlistment - from "copper" to "mulatto" to "yellow" to "black." The mix of these regiments included Tongans, Chinese, Indians and many others, including dozens of Hawaiians. Also included in the D.C. memorial are white officers from Hawaii, such as Armstrong, whose experience living among non-whites made them champions of the cause - a dangerous occupation, as Confederate law targeted officers of black troops for execution. 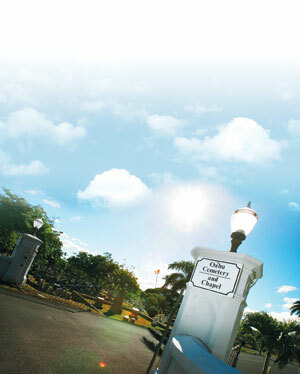 "It's one aspect of Hawaiian history no one knows much about," said Ellis. She's determined to change that. » TheBuzz "Erika Engle is on assignment"